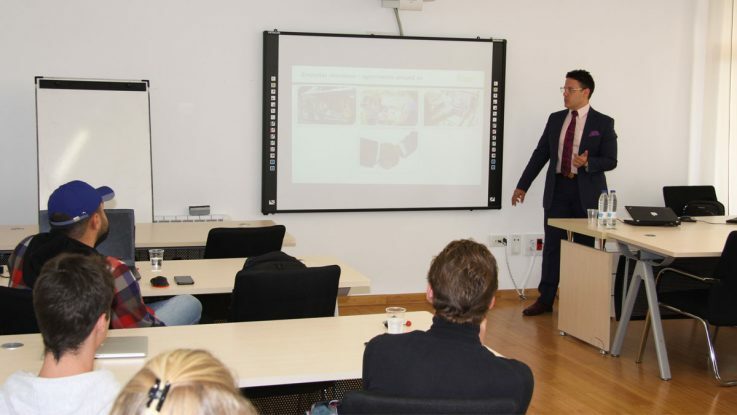 In April Guest Lecturer Dr. Edvinas Meškys delivered a practical workshop to international business students on Contract Drafting: Tools and Risks. Understanding a contract drafting: shall an entrepreneur become a lawyer? Each enterpreneur has enough to worry about when running the business- from meeting with clients, handling customer relationships, social media updates, so the list is endless. The last thing he/she wants to be doing is lawyers work, i.e. scrambling at the last minute to pull a contract together for a new client. Or maybe enterpreneur has a contract, but each time he/she sends it out to a new client for signature, he/she wonders: Do I have everything I need in a complex contract? Is it too much or too little? Is anything in illegal in a contract? Does a contract protect me as the owner or a manager and my business? Do the terms even make sense? How will I explain a term to a client that I don’t even understand? Finally, do I have to show this contract for a lawyer? Will I be able to explain my needs? These questions might arise for any person, as we face agreements everyday when shopping online, entering public bus, trading on the market, accepting terms and conditions for the use webpage, etc. Therefore, the aim of the lecture is to explain why many contracts are so poorly drafted, to present the main parts of the contracts and recommended clauses, identify possible financial, reputational and legal risks with practical examples from lecturer’s work experience. The future of “smart” contracts on blockchain was discussed.